Looking amidst my million and one products I noticed my rituals products glowing between the many boring bottles. I don’t know why I have never written about them before, perhaps I was being evil and trying to keep them all to myself or perhaps I just forgot about them…remember we can’t rule out anything. Anyway! I only own two rituals products not because I don’t like them but, because they are more of a ‘splurge’ kind of product for me. I also adore the orange and cedar wood scent so I can’t be unfaithful and branch out to other smells. Let me just fill you in on the fact I wasn’t supposed to buy these products. I walked in to the newly opened rituals shop near me and came out with three new products in tow ( two for me one for my slightly confused mum). The lady was so nice and really convinced me that rituals was the best thing I could ever buy that I bought it. Looking back it makes me laugh at how I was justifying the purchase but, i’m glad I did because they are some of the best smelling products I have ever bought. it smells absolutely out of this world. There’s not much else I can say apart from it smells fantastic. It’s not an overpowering fruity smell it’s just perfect and leaves you smelling heavenly for hours after (something you don’t often get with a lot of shower gels and body lotions). 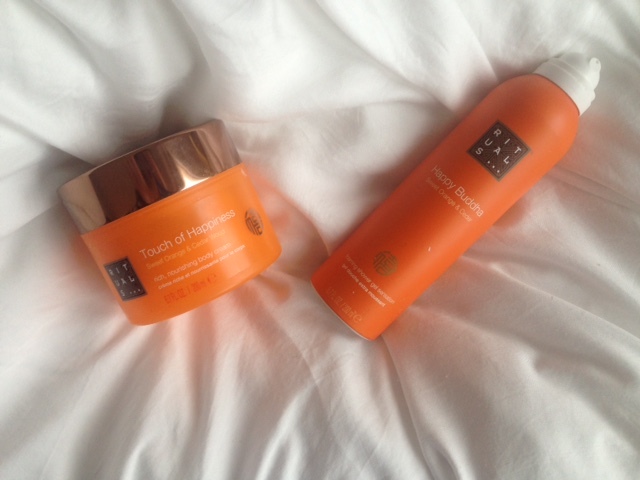 I used these products all last summer so smelling them instantly takes me back. It just smells like the best perfume, lush shop, spa and orange tree you have ever walked in to in your life (if you have walked in to all of these things I am impressed). 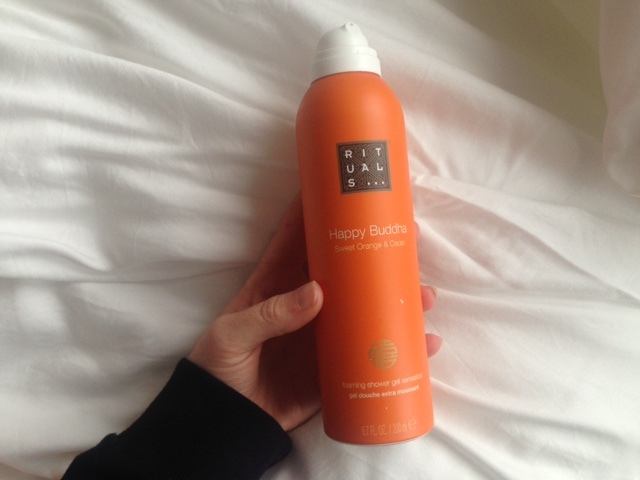 Tell Me About The Happy Buddha Sweet Orange And Cedar Foaming Shower Gel? Despite shuddering with every slippery, wet touch this clear shower gel instantly became white and foamy and expanded a bit like hair mousse. It was so amazing at how much it spread around and how easily it washed off again. I picked it up straight away, one for the novelty and two because it just smelt delicious. 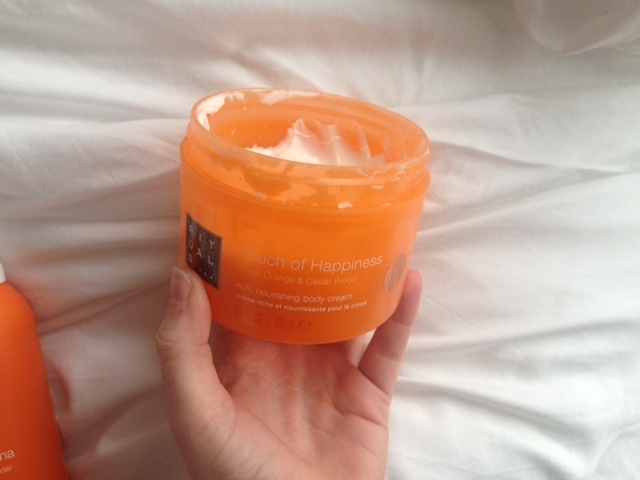 What About The Touch Of Happiness Sweet Orange And Cedar Wood Body Lotion? I picked up two of these, one for my mum and one for me. I am sucker for body lotions and this just spoke to me on another level. It is so soft and so smelly and so rich, I just couldn’t say no. A tiny amount goes a long, long way and the smell lasts for ages and ages. I’ve been using this tub since last summer and it’s still halfway full! it’s just so lovely and really compliments the foaming shower gel. Overall I love these two products. I think the packaging is beautiful, every single store I go in to is beautiful and smells amazing. The products themselves smell so rich and so expensive (if you know what I mean!) I just love them and even though they can be quite expensive, they are worth it for how long they last and how nice they are on your skin. You can check the rituals foaming shower gel for the best price online by clicking here if you are in the EU and here if you are in the US and the rituals body lotion EU – US. I hope you enjoyed this rituals review, if you did please let me know in the comments below and let me know if you have tried any rituals products.